Updated 7/6/2016 – Added the FPV Ninjas and Range Video offerings. Updated 7/21/2017 – Added in Betaflight OSD compatibility and adjusted suggestions. Updated 8/27/2018 – Overhauled the guide with new technologies and purchase options. several options, generally at 25mW, 200mW and 600mW. 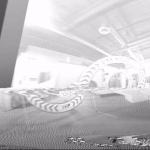 25mW is fantastic for indoor flying and racing events. In a good setup this will generally get you sufficient range to fly any FPV racing track. 200mW is a great all-around compromise and can get you enough range to do some serious exploring. 600mW is pretty overkill in most situations. I would generally avoid it unless you specifically need it for some reason. Many newer transmitters have adjustable power output. This gets you the best of all worlds: you can use a lower power output for races and indoor events, and crank up the power when doing long range FPV in remote places. Another important thing to consider when picking your power output is your local regulations. In Europe and many other populated countries around the globe, it is illegal to broadcast at power levels above 25mW. In other parts of the world, operating at higher power levels requires a special permit or license. For our USA readers, we have an article on getting your HAM license. Readers from other parts of the world should consult local regulations before flying with a VTX. Wireless Band – There are several wireless bands that you can legally transmit video over. The most popular of these are 5.8GHz, 2.4GHz and 1.3GHz. In practicality, however, you will almost certainly end up using a VTX that runs on the 5.8GHz band. This is because transmissions on a lower frequency have the tendency to lower the signal quality of transmissions on higher frequencies. Since most of us use radio control transmitters that operate on the 2.4GHz band, we cannot use any bands at 2.4GHz or below – lest we want our control link to be weaker than our video link! Another reason to stick with higher frequencies for video feeds is that antenna size increases drastically on 2.4GHz and 1.3GHz – and no one wants a huge circularly-polarized antenna hanging off of the back of their quad. 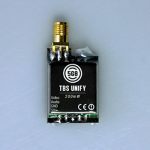 If you are building an FPV airplane or a larger quadcopter and have a long range radio control link that operates on 900MHz or 433MHz like TBS Crossfire, your options for using lower frequency bands open up considerably. In this case, the lower frequencies will net you a much longer range and improved signal penetration through trees, structures and other blocks. A small downside is the fact that you will lose some video quality as lower frequency bands, particularly 1.3GHz, can carry less data than higher bands. You’ll also have to put up with the huge antennas. Most VTX’s will come with a “band chart”, which shows what bands are supported and how to activate them. This is the band chart for the Hawkeye VTX. 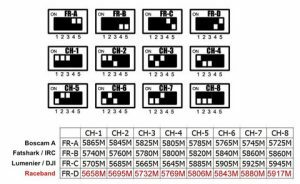 Channel Support – The wireless video spectrum can be broadcast across a broad swath of frequencies, or channels. When you buy a VTX, you will most likely see a “channel chart” that is shipped with it. This lists the channels that the VTX supports. Generally these channels are incrementally aligned with what is called a “Band” or grouping. This is not to be confused with the aforementioned “bands”, which refer to large swaths of the RF spectrum — these “bands” are referring to different partitions of the same frequency space. In the past, different manufacturers only supported one band – so ImmersionRC transmitters only transmitted on the ImmersionRC band and Boscam only transmited on the Boscam band. This ensured that you had to buy a matching video receiver to go with your VTX. These days, things have gotten more open and most VTX’s support all of the bands out there. If you do decide to buy a VTX that only transmits on one band, you’ll want to double check that your video receiver (or goggles) can receive video on the band(s) that your video transmitter can transmit on. You could claim that this rampant desire of manufacturers to “one-up” each other with band support has gone too far. Recently, we’ve seen a lot of transmitters being released with support for bands that operate outside of the traditionally defined 5.8GHz spectrum. For example, L-Band. Using these bands could result in you transmitting on illegal frequencies. We recommend you stick to “A”, “B”, “C”, “D”, or “R” bands. “Compatibility” – One claim I’ve seen on many Video Transmitters is that they are “compatible with FatShark”. This is something you should really ignore. “Compatibility” is solely determined by the channel support of the video transmitter (see above). Don’t be duped into buying an inferior video transmitter because of claimed “compatibility”. Form Factor – Standard VTX’s are small devices about the size of a RC RX that you place in the rear of your quadcopter frame. Some manufacturers have started producing VTXs that can be mounted in the 30mmx30mm square over the flight controller. If your frame is tall but not long, this may be the best type of VTX to buy. Size & Weight – It seems like this makes its way into every buyers guide – but for good reason. The size of your VTX determines how much spare space you have on you miniquad for other parts. Some of the particularly compact 210mm frames cannot even fit many VTX’s! Weight is always a concern when building miniquads. 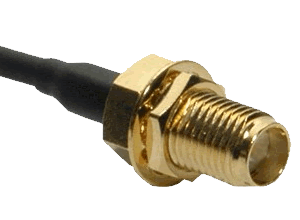 The female SMA connector is pretty much the ubiquitous antenna connector for video transmitters. SMA – This is a relatively large, threaded connector that was the standard for a long time. It comes in two variants, SMA and RP-SMA. Make sure that if you get a VTX with an SMA connector, you also get an SMA antenna, and vice versa for RP-SMA. uFL – This connector is considerably smaller than SMA connectors and is therefore often used on smaller and lighter quadcopter. It is press-fit into place, so can come loose in a crash. This can cause some VTX’s to overheat and fail. MMCX – This is a newer connector type that has been popping up lately. It is also a press-fit connector but is far larger than the uFL. It would take a lot of force to cause one of these connectors to pop out during a crash, so it balances the design tradeoffs between SMA (durability) and uFL (size/weight). The downside is it is tough to find an MMX antenna. Direct Solder – Some VTX’s offer the ability to directly solder your antenna to the VTX board. This theoretically can improve range, but we don’t recommend it for the faint of heart. There is a reason that RF engineers are often called magicians. In general, you can almost always buy a converter that change one connector to another. 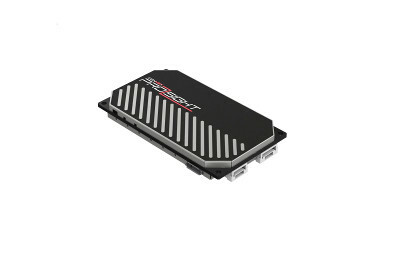 However, these converters will cause a loss which ultimately degrades video quality and range. It is always best to buy a VTX that will work with the antenna that you are going to use. 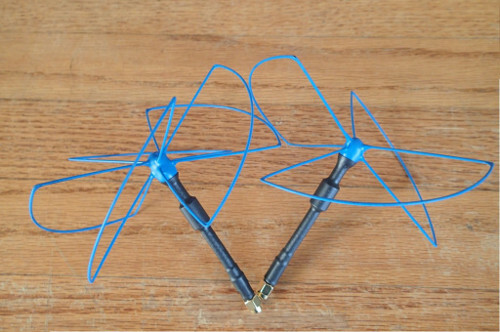 To learn more about miniquad antennas, check out our antenna buyer’s guide. Internal Microphone – Some video transmitters come with internal microphones installed. 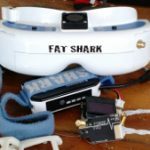 These VTX’s will allow you to hear your quad while flying by plugging set of headphones into your goggles. Some pro pilots swear by this – claiming it helps them hear the quad’s power level and identify the attitude better. I wouldn’t pay $10 for this feature but it is definitely “nice to have”. Enclosure – Most video transmitters are bare PCBs with an antenna connector on one end wrapped in heat shrink. As long as these are kept within your frame, they are relatively safe. If you need your VTX to be more robust for some reason, you should consider a VTX with an aluminum or plastic enclosure. Keep in mind that enclosures add weight, however. Voltage Tolerance – Some VTX’s will require a regulated power supply. Make sure you pay attention to the input voltage tolerance of your VTX if you are planning on hooking it directly to battery voltage. Know that sometimes hooking up to battery voltage can put electrical noise into the VTX causing video artifacts. Better video transmitters will be immune to this phenomenon, but there’s no real way to tell without reading reviews. It’s important to note that many VTX’s will not operate properly on 5V. This is OK because the VTX is the most power hungry chip on your quadcopter and can cause many voltage regulators to overheat and “brown out” (which basically means a crash). However, if your use-case calls for operating on low voltages (which is often the case for microquads), make sure the VTX you want to buy supports those lower voltages. Channel Switching Mechanism – There are three popular ways to switch video transmitter channels on the market: DIP switches, which are changed using a small screwdriver while the VTX is powered off are the simplest and oldest. You will need to carry around a coded chart to determine which DIP switch configuration corresponds to which channel. Digital switchers with a button and a tiny display have become more popular lately. They work by pressing a switch to cycle through the channels when the VTX is on. They are a problem, however, when flying with friends since the act of changing the channels means you will actively be switching through channels which are probably being flown on. For this reason, these are often banned at racing clubs. Finally, there are video transmitters which can be programmed using an infrared remote. Often times these are “paired” to a proprietary receiver. They are great because they are both convenient and do not run the risk of walking over your friends’ FPV session. Many newer VTX’s support channel swapping from Betaflight OSD, see the next section. 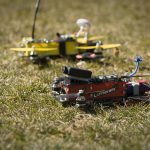 Pit Mode — A big hassle for miniquad race directors has always been pilots who switch their quadcopters on in the pits while a race is underway – thereby causing one or more pilots to crash when their video goes dark. VTX manufacturers have attempted to fix this with “pit mode”, which is an extremely low power setting that is used when a quadcopter is initially powered up until the pilot explicitly commands “full power”. If you race a lot, you’ll want a VTX with pit mode. If you don’t, it probably wont mean much to you. 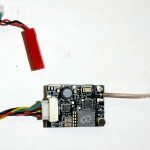 Betaflight Programming Support (SmartAudio, Tramp Telemetry) – This is a digital telemetry protocol that allows your flight controller to directly talk to your video transmitter, enabling you to change channels, power output, enable “pit mode”, etc from your transmitter via the Betaflight OSD. This is a deceptively cool feature that you will never want to be without once you try it. ImmersionRC has been a long-time player on the VTX market. 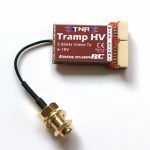 Their recently-released Tramp HV VTX is simply the best miniquad video transmitter on the market. It has the best signal quality, a great form factor, several safety factors designed in, can be powered off of battery power, interacts with Betaflight and is all around a fantastic VTX. This isn’t even mentioning the fact that it is programmable with a special wireless wand that many race directors are using these days to quickly assign VTX channels. Expect to see some clubs require the use of this VTX in the near future. The problem is these things are eternally sold out. We really hope ImmersionRC picks up the ball someday soon so that it is easier to get our hands on it. 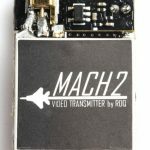 The RDQ Mach 2 is a solid competitor to the Tramp HV in the VTX market. We really like the soldering pads for electrical connections, the multiple packaged connector options (u.FL, MMCX and direct soldered supported, SMA adaptor included), and the output power options – including an 800W mode for those times you want to fly really far. RDQ stocks a variety of other VTX’s, including the incredibly low priced Mach 1 as well as some alternative form factors. 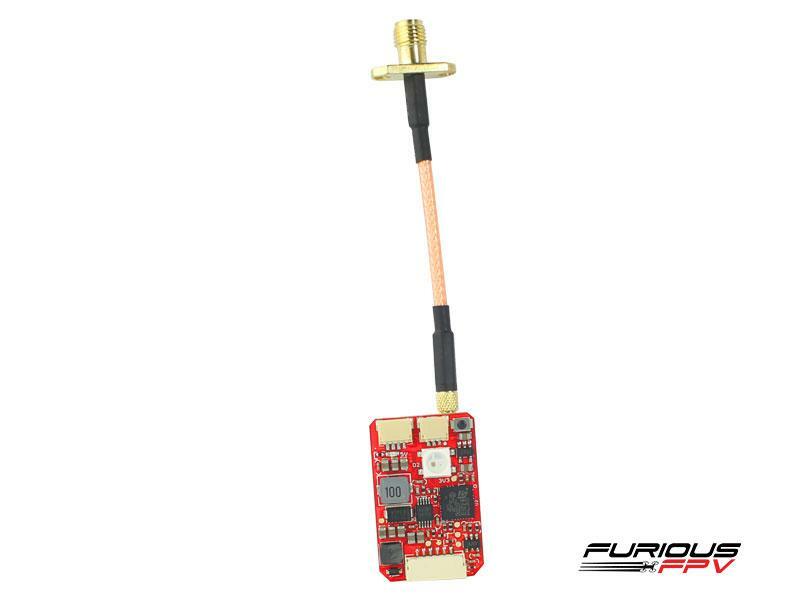 FuriousFPV is the third party on the market offering top of the line video transmitters. Their “Stealth” lineup includes several variants from a long range, 700mW option, to an insanely tiny option for smaller quads. Like RDQ’s Mach series, several form factors are offered, so check out their website. AKK produces low-cost VTX’s with just about every form factor and flavor of antenna connectors on the market. We reviewed the X2P here, and really liked it. 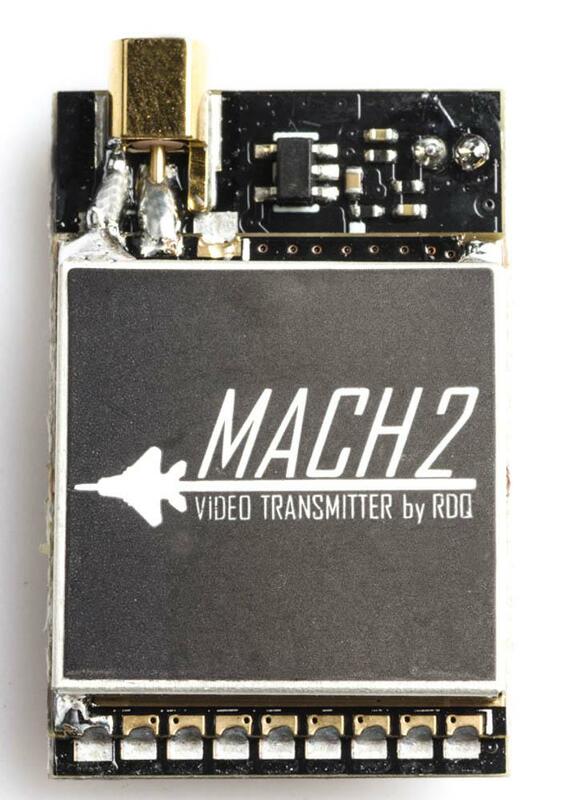 They have come under some fire for copying the RDQ Mach 2 VTX and for this reason we recommend you go with the Mach 2 for more or less the same price. Check out AKK’s other offerings on their website. Most are available with Prime shipping via Amazon. Team Black Sheep (TBS) came out with the Unify video transmitter last year as part of an effort to finish up their Powercube flight stack – which now encompasses all of the electronics you typically find on a miniquad. The Unify is controllable through a button or through an interface with the Powercube OSD. It’s one of the smallest transmitters on this list, comparable in size to the Hawkeye. However, it has a really clever SMA connector on the end of the pigtail which has a built in flat plate to mount against. I really like this design, having broken Hawkeye antennas in the past due to sheering against the carbon fiber. Power output is user adjustable between 25mW and 800mW – giving you a little extra power over most of the other players here if you need it. 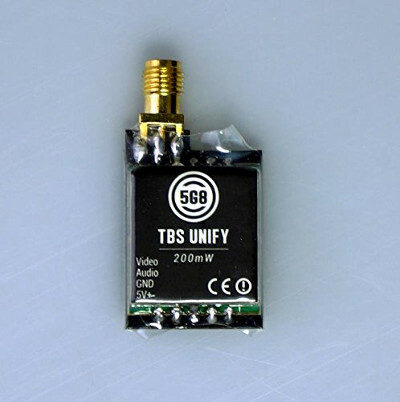 The TBS Unify can also interface with Betaflight with it’s SmartAudio feature, allowing you to program channel and transmit power through your OSD. 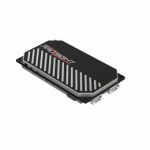 The ProSight system is an outlier – it is a fully digital HD FPV system produced by Connex. It is the first extremely-low latency digital video link that is small enough to fit into most miniquads. We wrote an article on the benefits you will get from a digital link here. It is a bit pricey at $400, but for that you get the VTX, camera and receiver. Depending on what you are looking for, this value proposition may make sense.